How to watch The Last of the Mohicans (1992) on Netflix Canada! Sorry, The Last of the Mohicans is not available on Canadian Netflix, but you can unlock it right now in Canada and start watching! With a few simple steps you can change your Netflix region to a country like Egypt and start watching Egyptian Netflix, which includes The Last of the Mohicans. We'll keep checking Netflix Canada for The Last of the Mohicans, and this page will be updated with any changes. The Last of the Mohicans is not available in Canada BUT it can be unlocked and viewed! When rugged frontiersman Hawkeye saves the Munro sisters from a Huron ambush, he ends up in a battle between the British and the French. Raised as an Indian by a dying tribe. Fighting for what he knows is right. He follows his conscience ... and his heart. There is a way to watch The Last of the Mohicans in Canada, even though it isn't currently available on Netflix locally. What you need is a system that lets you change your Netflix country. With a few simple steps you can be watching The Last of the Mohicans and thousands of other titles! 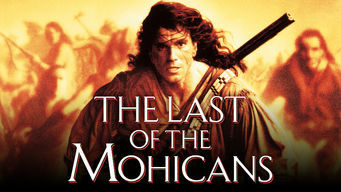 Watch "The Last of the Mohicans"